Bird fouling removal is an essential part of the pest control process. If left unchecked, bird droppings can pose a serious health and safety hazard- which is why Pest Solutions always take this part of our job very seriously indeed. In themselves, pest birds can be an extremely annoying problem. Some species, like gulls, cause a huge amount of noise and may become aggressive towards humans in some instances. However, one of the biggest effects of a pest bird infestation isn’t the birds themselves- it’s what they leave behind. Not only is bird fouling an eyesore, but it also poses a serious risk to public health and safety. 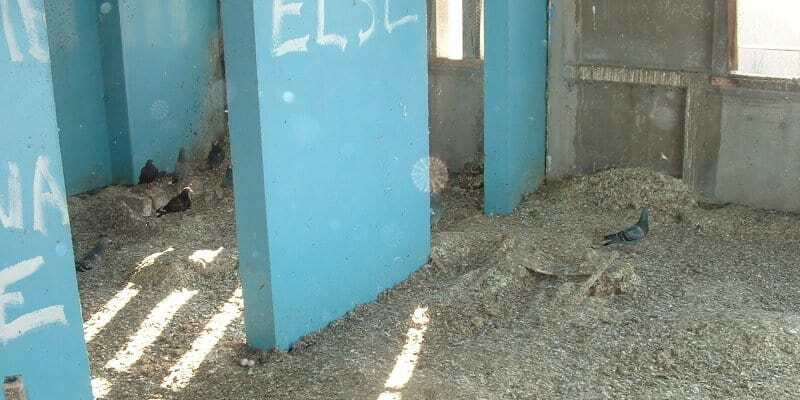 Bird droppings can carry all sorts of nasty diseases, and when a lot of it is present in one area it can become a slipping hazard. Whether it’s covering your home or your workplace, nobody wants a building covered in bird faeces. If this becomes a major issue for you, then there’s no time like the present to do something about it. Bird fouling removal can be a difficult job, though. Not only is it dirty work to scrub bird excrement off walls and ledges, but reaching higher areas may also pose a health and safety risk. This is particularly true when there is a large build-up of bird fouling- as we mentioned earlier, this can make areas incredibly slippery, so you don’t want to end up sliding on it and falling from a great height. Instead of tackling this tough and often dangerous job by yourself, why not let the experts handle it? At Pest Solutions, we use the safest, most effective methods of removing all traces of bird fouling from your property. Why is Bird Fouling Removal So Important? As we mentioned earlier, bird fouling poses a major hazard to public health and safety. It’s not just the areas that the birds perch on that will be affected either. Should any of those droppings make their way into ventilation systems, then the hygiene of the whole building could be compromised. The bacteria and fungi from the droppings will get sucked into the vents and circulated around the entire ventilation system, putting the health of everyone inside at risk. This is why it is vital to completely disinfect the affected areas with the right cleaning products, to prevent any invisible germs from having a serious impact on those within. It isn’t just people’s health that’s at stake, either. Bird droppings tend to be highly acidic, which means it can cause serious damage to surfaces if it isn’t cleaned up fast. Paint finishes and tar-based roofs are especially susceptible to this, so the effects of bird fouling could end up costing you a lot of money in the long run if left unchecked. Even worse, limestone and sandstone buildings can become permanently damaged by the acidic secretions of bird dropping, putting many of our country’s most notable public buildings at risk. Pest Solutions therefore take bird fouling removal very seriously, and always act promptly to clean up the problem before it can develop into a larger issue. All of our technicians possess the necessary training and qualifications to work at heights, so they can safely carry out this essential work on your behalf. We also use carefully selected cleaning products that aren’t overly harsh and therefore won’t damage your property any further. While we are careful to cover every last inch of the affected areas, our pest control technicians still work fast to clean up the bird fouling as quickly as possible. Of course, those droppings are typically a sign of a wider pest control problem, and may well indicate that your building is experiencing a pest bird infestation. In such cases, we will be happy to offer a free, thorough, and no-obligation survey to get to the very heart of the issue. This will allow us to come up with a tailored pest bird control solution that will keep these flying nuisances away. From bird netting and bird spikes to audible and visual bird scaring systems, we have a wide range of different tools at our disposal. Thanks to our high level of experience in the pest control industry, there’s no task too big or small for our professional technicians to handle. Get Rid of That Pest Today Call Pest Solutions! At Pest Solutions, we offer a wide range of pest bird control products to help you keep gulls, feral pigeons, and other irritating flying menaces away from your property. Yet these methods are only the first part of the solution. Once the birds are gone, it is important that you have the area properly cleaned so that no remnants of their droppings are left behind. You don’t need to tackle this dirty job yourself, though. We wouldn’t be a proper pest control company if we didn’t deal with all the aspects of a pest problem, so you can count on our technicians to keep your property completely clean and pest-free. We are the pest bird control experts. For all aspects of pest bird control and bird fouling removal, simply call Pest Solutions on 0800 027 2555 to arrange a FREE survey or a service call out. Our professional and discrete technicians are ready to help and advise you to ensure that your peace of mind is restored.